Spanish designer Armand Basi has launched Rose Glacée, a new floral fragrance for women. Rose Glacée aims to evoke the scent of a just-cut rose in the morning dew. Rose Glacée was developed by perfumer Françoise Caron; notes include grapefruit, lemon, green apple, rose, cinnamon, peach, light woods, amber and cristal musk. 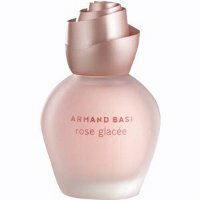 Armand Basi Rose Glacée is available in 30, 50 and 100 ml Eau de Toilette. It looks like a cup of frozen yogurt and from the sound of the notes it probably smells like it too. Sounds quite nice, except for the always-worrying grapefruit note (cat-pee on me). The bottle is very pretty. I have a yen for it in a body lotion from the opaque appearance of the bottle. I’d like to try it. I don’t think I’ve ever seen an A. Basi scent, so I’m not going to worry about it either way. Lola and Daisy really set off a furor of beflowered bottlecaps. This one is most reminiscent of Justin Beiber’s cap, although even cheaper-looking. I find when rose is great it’s amazing, and when it’s bad it’s really, really bad. I hope this one really does smell like actual fresh roses as described. Love the bottle design, but as one commenter already mentioned: the grapefruit not worries me. Tried this one and it’s a copy of DG Light Blue. The bottle and title hint at Yes!Yes! The notes say Oh,no…another tutti frutti; I’m afraid.